Regal Fancy Basil Leaves - 3.5 oz. Finish off your signature dishes with Regal fancy basil leaves. With a distinctive dark green coloring and sweet, pungent flavor, Regal fancy basil leaves are ideal for recipes in any Mediterranean, Italian, or American-style restaurant. 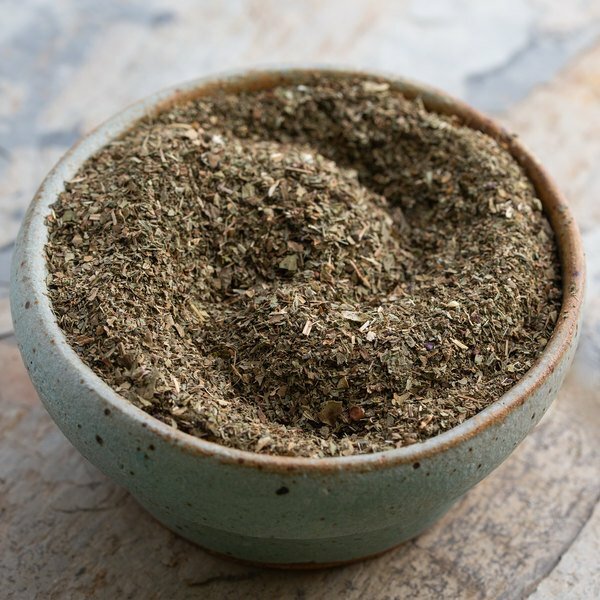 This seasoning pairs well with a number of traditional herbs, including parsley, rosemary, oregano, thyme, and sage. Thanks to the handy 3.5 oz. container, it’s the perfect amount for low- to medium-volume restaurants or cafeterias. "I use a lot of basil in my pasta sauce and this is a great value. It arrives smelling very fresh and fragrant. I've bought basil from other retailers that was stale - not this!" 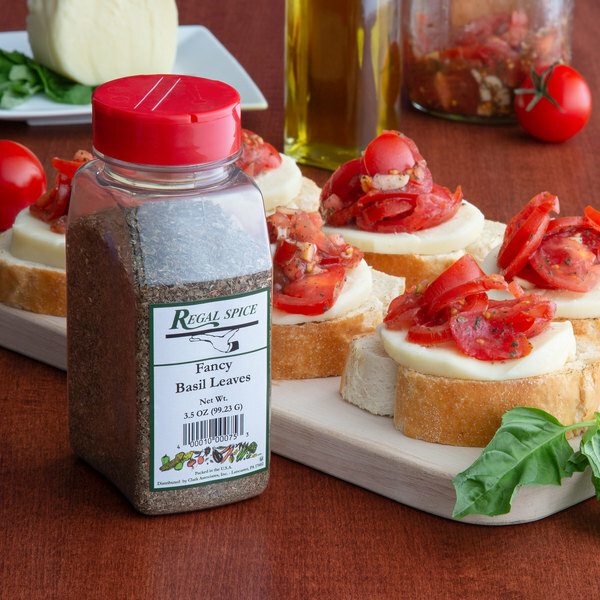 To maintain its strong flavor, fresh basil leaves were dried and crumbled to create these delicate flakes. You can crush these leaves before adding them to your cooked dishes or rehydrate them with oil and vinegar for a delicious dressing. Basil has a sweet, refreshing scent and a strong flavor that's peppery and slightly minty. It's popular in Mediterranean and Italian cuisines. Since the flavor of basil can be ruined with too much cooking, it's best to add it at the last moment or leave it raw. This makes it perfect for tomato sauces, pesto, and dressings. Regal Herbs and Spices are a smart addition to any kitchen. This handy 3.5 oz. container is easily accessible for your cooking and seasoning needs. Be sure to check out our quantity discounts for even better wholesale savings! Is this product packaged in a BPA free container? Yes, the plastic spice storage container is BPA free. 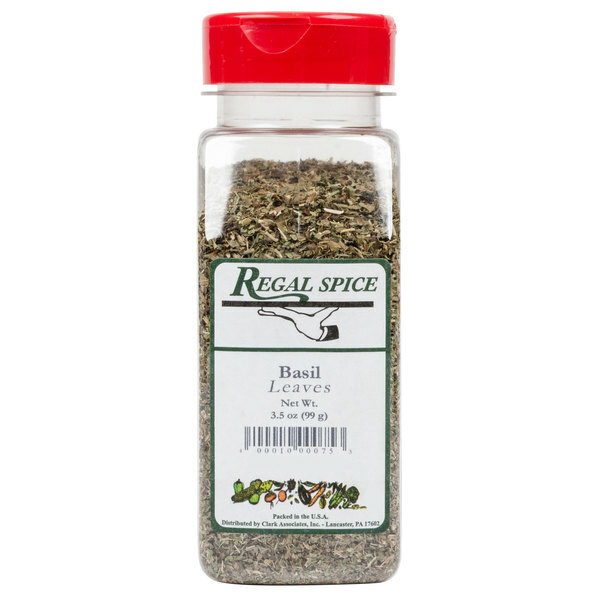 Item #: 10207011 Regal Fancy Basil Leaves - 3.5 oz. 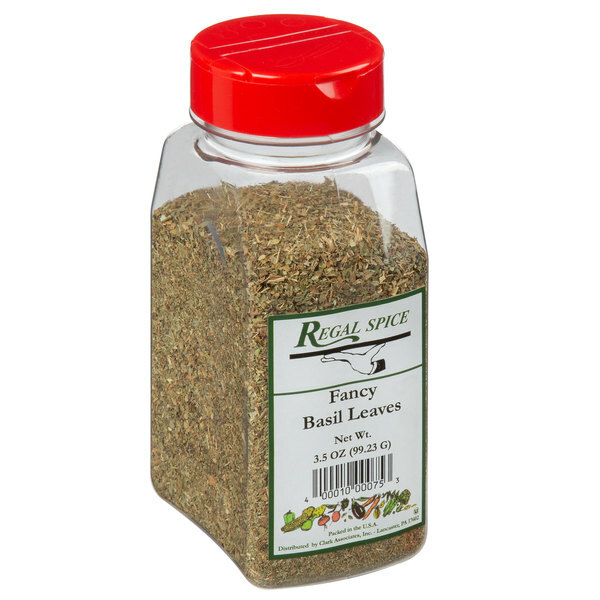 Item #: 10200012 Regal Fancy Basil Leaves - 2 lb. 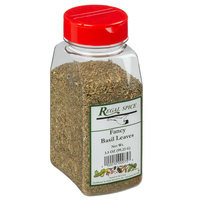 Regal Thyme Leaves - 3.5 oz. Regal Rosemary Leaves - 3 oz. 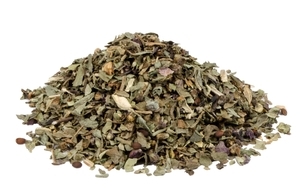 Regal Tarragon Leaves - 1 oz. Regal Crushed Spearmint - 3.5 oz. Regal Parsley Flakes - 1.5 oz. Regal Marjoram Leaves 2 oz. Regal Bay Leaves - 1.5 oz. Regal Cilantro - 1 oz. 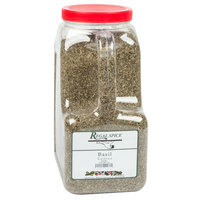 Regal Fennel Seed - 8 oz. Regal Gourmet Peppercorn Medley - 8 oz. Regal Ground Turmeric - 6 oz. Regal Anise Seeds - 7 oz. Overall User Rating: Regal Fancy Basil Leaves - 3.5 oz. Regal fancy basil leaves are a great addition to the spice cabinet. Great flavor and the price can't be beat. Will definitely be purchasing again. Great product! Super fast shipping and a wonderful price! I didn't expect much for such a cheap price but this basil is perfect, great flavor and works just as well as much more expensive brands we've purchased. Will be getting all my spices from Webstaurant from now on! A must have when you don't have the fresh stuff on hand. I use this for pasta sauce and it really adds the needed flavor. Great product, very flavorful and perfect chop size. helps add the perfect flavor to bruschetta chicken, pasta sauce and other Italian dishes. Will order again! The Regal brand never dissapoints. This is an exceptional value. Ounce per ounce, this more than surpasses my local warehouse store. These herbs are very flavorful with a nice bright, rich color. Very high quality Basil leaves. I used these on my parsley potatoes and I am satisfied with the taste and freshness. Will definitely be ordering these again. I love the regal brand seasonings! 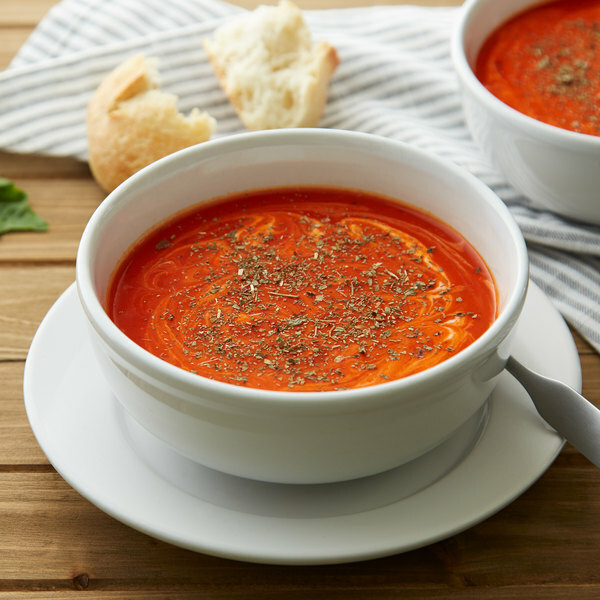 The basil tastes great in our homemade soup! I love the choice of small or large quantity as well. Highly recommend this product! This basil is an amazing, quality product and a great buy for the price. It was sealed well and is very fragrant. A great additon to any spice cabinet. We use many dried herbs every day. This product smells outstanding, tastes great, and is less than half the cost when compared to the previous brand our restaurant has purchased. These basil leaves have good flavor, and are a very good price for the quality and quantity. We use this primarily in our pasta sauces, but it would be a great choice for any application where dried basil is required. I love these basil leaves! The price on this is great! It has a great aroma. I would definitely recommend to my friends and family! I do a lot of canning and needed items in bulk, found them here at a great price. Shipping was a bit much though. The items were good quality. These fancy basil leaves from Regal provide just the right amount of flavor. I have often found that dried basil can lack flavor but not these! Will definitely buy again! 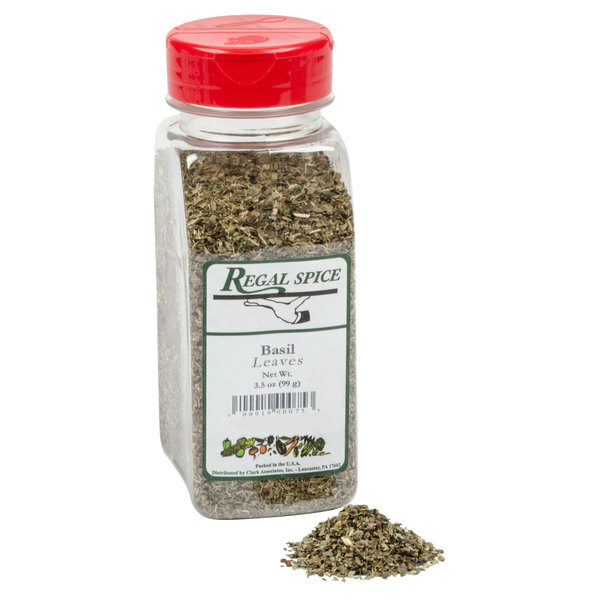 This dry basil is very fragrant and adds a great flavor to sauces and marinades. It's very coarse, so give it time to cook down or grind it in your palm first to bring out more flavor. Is the basic dried basil in a 3.5 ounce container. The containers a little smaller than I was used to but since we use such little it's perfect for us. Regal spices are now my go-to spices to purchase for daily use. I use a lot of basil in my cooking (mostly italian) and the basil is pretty fresh and smells and tastes great.